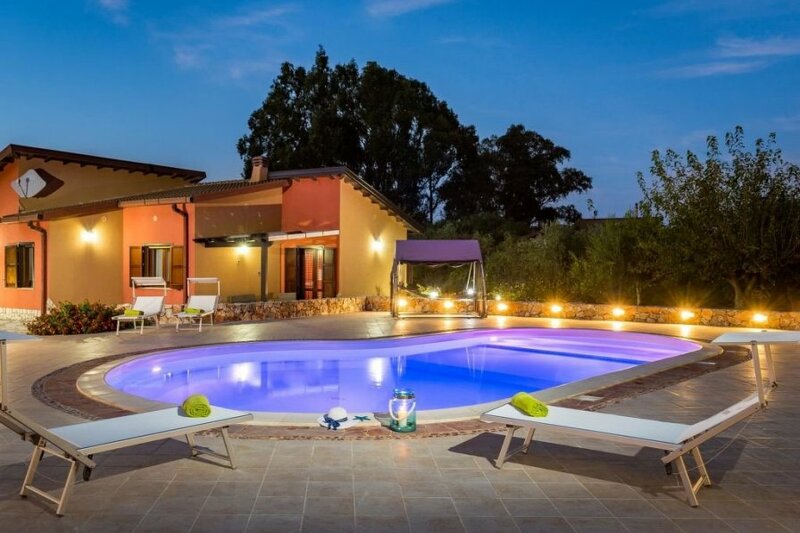 This 3 bedroom villa with private pool is located in Case Boscia and sleeps 5 people. It has WiFi, air conditioning and barbeque facilities. Living/dining room with cable TV, open fireplace, dining-table and dinette. Smoking not allowed. Internet (Wireless LAN WLAN). The villa has 1 complete bathroom with shower inside and 1 external bathroom in the pool area with 2 showers..
Modern, comfortable villa "Flavia", built in 2017, surrounded by trees. Air conditioning, washing machine (private use). On the outskirts of Castellammare del Golfo, quiet position by the sea. * Garden (private use), swimming pool (private use), barbecue (private use), fireplace (private use). Please note, nearby is an ein airport/airfield in 55 km.. The agent describes this villa as a family friendly holiday rental ideal for the summer holidays. It is also good value for money. The villa has a private pool and is located in Case Boscia. The nearest airport is only 49km away. It is set in a convenient location. The villa has free wireless internet. You can also park on-site at no extra charge. The villa is well equipped: it has air conditioning, a microwave, an oven and a washing machine. It also has a BBQ.